When we think of the beer consumed at the Munich Oktoberfest, many brewers picture the classic Oktoberfest/Marzen style: a hearty, dark, and malty brew with great head retention and a warming alcohol bite. While this may have been the case over fifty years ago, today’s Oktoberfest beer is quite different. The beer that the masses are drinking at today’s festival is more akin to a Munich helles than to a marzen. It tends to be a light body beer that, while still malt focused, is usually much lower in alcohol. The added digestibility and drink-ability of this modern lager makes it more of a “sessionable” beer, but it is far different than the traditional beer of the fest. 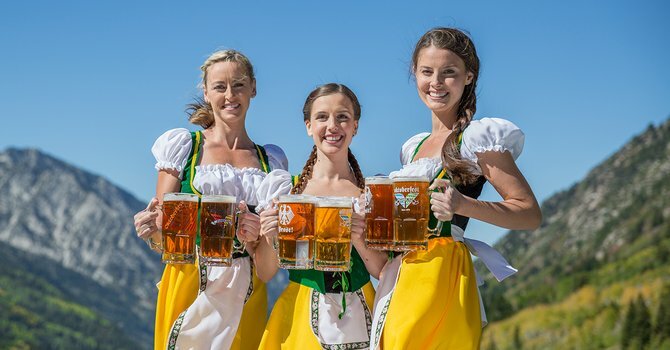 While many of us romanticize Oktoberfest as a beer focused holiday, the truth is rather more… sober. The original festival started as a celebration of the marriage between Prince Ludwig of Bavaria and Princess Therese of Saxony-Hildburghausen in 1810. 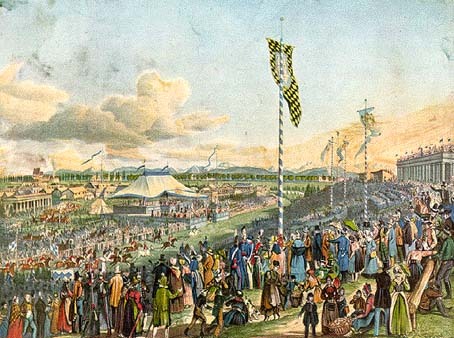 The event was celebrated with a fair and horse racing, but beer did not play a central role. Of course, there were venders around the outskirts of the fair selling some brew but it was definitely not the focus of the event. As the years went by, the festival became more beer centered and in 1896 the first beer tents were raised. This growth in beer’s presence at the festivities was no doubt a byproduct of the festival falling around the beginning of the brewing season. Before the age of refrigeration, brewing was governed by the seasons. 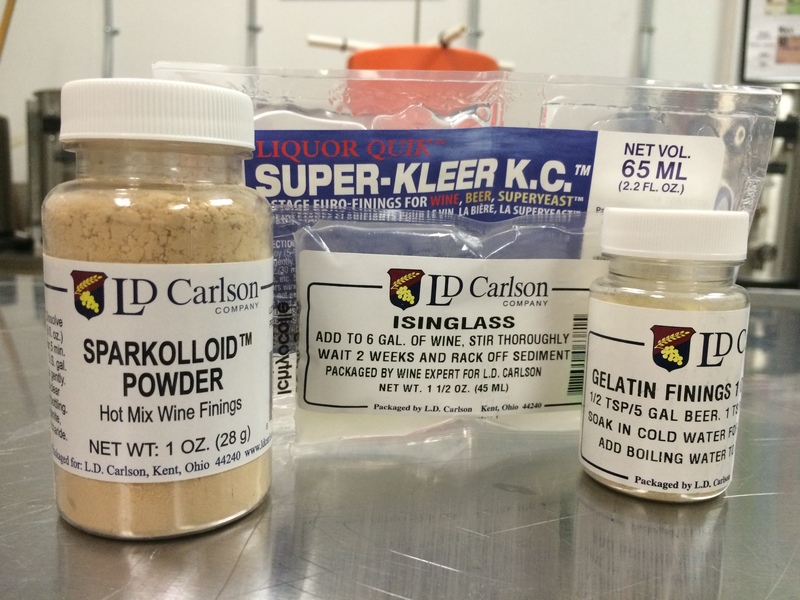 The fall and winter were the brewing seasons since the temperatures were ideal for brewers yeast (both ale and lager species). Towards the end of the brewing season, usually March in Germany, a final strong beer was brewed to last until the beginning of the next brewing year. This March beer, or Marzen, was then stored in barrels (often in dark and cold lagering caves) and consumed through spring and summer. Once fall rolled around, the brewers once again fired up their brew kettles and needed the storage barrels for fermenting the new year’s beer. The barrels were then quickly emptied is a semi-debaucherous set of festivities. The Oktoberfest festival provided an excellent avenue for draining the last of these Marzen barrels. The Oktoberfest beer I brewed this year falls into the Marzen category, making it more of a traditional Oktoberfest rather than a more modern example. I chose to keep the recipe simple, with a grist of 2 high quality German malts and two additions of one classic noble hop. I wanted the beer to have enough bitterness to be assertive but not so much that took away from the high quality malts. In turn, I wanted there to be a whiff of hops, but it should be subtle and almost undetectable. This beer is very malt focused with a hint of hops to balance out the residual sweetness. Although this is not a complex beer it is both very rich and very filling. It matches fall weather with its dark color and warming alcohol. As would be expected, it pairs very well with smoked brats. Mashed at 150 for 60 minutes with a single decoction mash to achieve mash out temperatures. Boiled for 90 minutes. Fermented at 55 F for 2 weeks with a diacetyl rest for the last 2 days. Lagered at 45 degrees for 1 month. Kegged and forced carbonated. First off, what is a tincture? A tincture is simply an infusion of a spice or herb in an alcoholic solution. Traditionally these were used for medical purposes, extracting and preserving the healing properties of herbs and spices for use at a later time. A happy extension of this practice is the infused alcohol which we enjoy in cocktails (think rosemary infused vodka martini or the infamous Jägermeister). For our purposes as brewers, we can use these tinctures to improve our homebrew. Tinctures allow a quick, precise, and relatively easy way of adding a unique and exciting boost of flavor to your beer. Tinctures provide the home brewer with a number of distinct advantages over simply adding the flavoring agents to the beer. 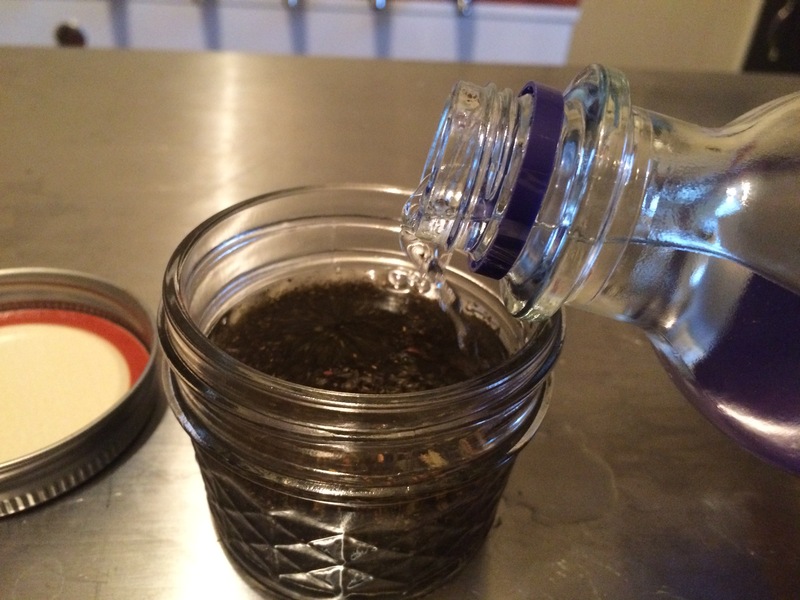 Firstly, tinctures allow for a precise amount of control over the amount of flavor added. When added at the end of fermentation or before bottling, the brewer can add small amounts of a tincture and taste the beer with each addition. This prevents the risk of adding too much or too little flavor and can cater the taste exactly to your personal preferences. The next great advantage is the reduced risk of infection. While many herbs and spices, hops included, have inherent antimicrobial properties, there are still some which may harbor bacteria. By soaking your flavor addition in an alcoholic solution, you are significantly reducing the chances of a rogue microbe getting into your beer. The alcohol not only extracts flavor but sanitizes at the same time. The final great advantage is the shorter time frame associated with tinctures. This is especially true when working with oak. When aging on oak, the time required for full extraction can be along the lines of months to even years. On the other hand, you can make an oak tincture (with either vodka or bourbon) and have it ready for addition within 2 weeks time. While it is true that this can take away from some of the complexity associated with oak, its time advantage can definitely outweigh this disadvantage. Any spice or herb can be used as a tincture. 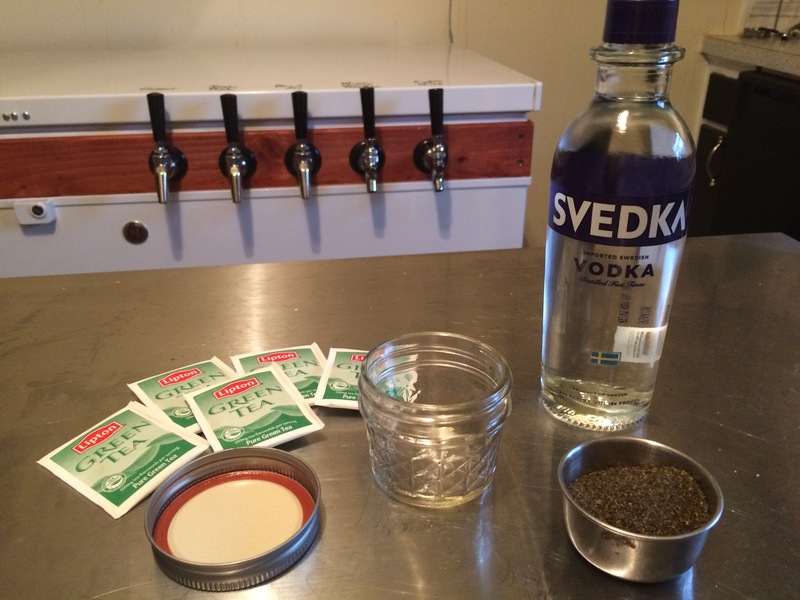 The most important thing to keep in mind is that the flavor of your tincture should compliment the beer you put it in. While sage may be delicious in a saison or Belgian wit, its flavors may clash with a malty porter. I’ve outlined a number of spices/herbs you may want to try, and the beers that they could go very well with. Sage: With a fresh yet potent aroma, sage screams out spring. It makes an excellent addition to saisons and Belgian wits but I would recommend using it with a light hand as it’s flavor can get overpowering very quickly. Rosemary: This is one of my favorite herbs and it lends itself very well to beer. I personally enjoy using rosemary in my saisons, but I could see it being an excellent addition to a Belgian golden ale or possibly even a dry cream ale. Mugwort: Said to ward off evil spirits and promote vivid dreams, this unique herb possess a sage like aroma and intense bittering potential. This is one of the ancient bittering herbs used for gruits. Try it today ind rich porters or northern English brown ales. Heather: This herb is common to the Scottish highlands and was commonly used in old school scotch ales. With the high taxes associated with hops (usually grown in more southern climates) the Scotts often turned to this bitter herb to mellow out the malt in their beers. Heather possesses floral and earthy notes. 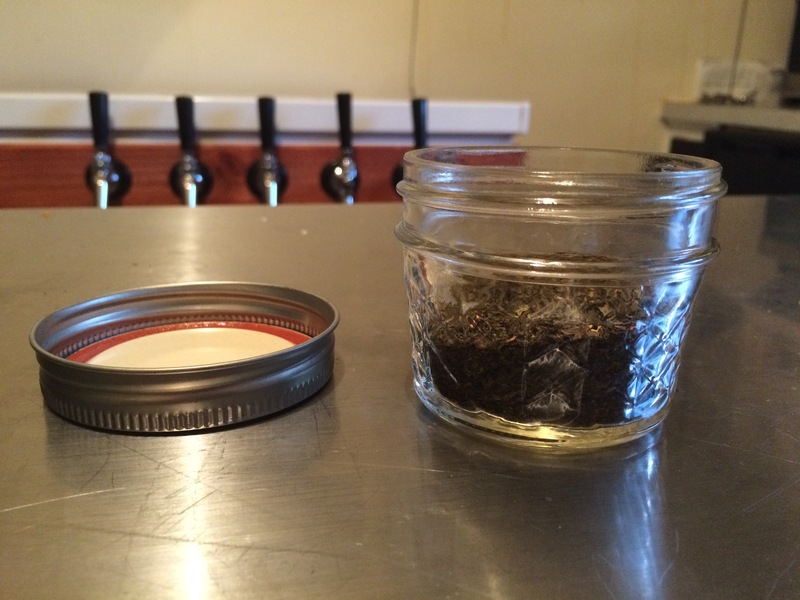 Try adding a tincture of heather to your next scotch ale. Cinnamon: This favorite spice can be found in almost every pantry across America. Obviously cinnamon imparts a cinnamon type flavor, but what many people don’t realize is that cinnamon lends a unique spicy heat to the beers it is put in. You could experiment by adding just a dash to your next stout or English mild. I’ve had a great deal of success adding cinnamon to Irish Red ales. Vanilla: We all know vanilla from various experiments in baking. Its flavors go very well in stouts, particularly milk stouts. For something a bit beyond the pale, you could try adding this to a blond or cream ale. If you want to try an example of this, Forgotten Boardwalk’s Funnel Cake Ale is a Cream Ale brewed with lactose sugar and vanilla. Cocoa Nibs: Cocoa nibs are just dried and fermented cocoa beans. They lend a rich chocolate flavor to your beer. For a pure chocolate flavor, add these to a neutral spirit such as vodka. For something a bit more extraordinary, you could add them to either rum or bourbon. Stouts would be the classic beer to add this tincture to but Triptych Brewery’s Golden Oatie adds coffee and cocao nibs to their blond ale with very unique results. Pumpkin Spice Mix: The types of beer that you could put this mix into are endless. My personal favorite style is a rich and malty amber, but I have put it in stouts and saisons as well with varying levels of success. Gingerbread Mix: I generally like putting this mix in brown ales but it really could go into anything. 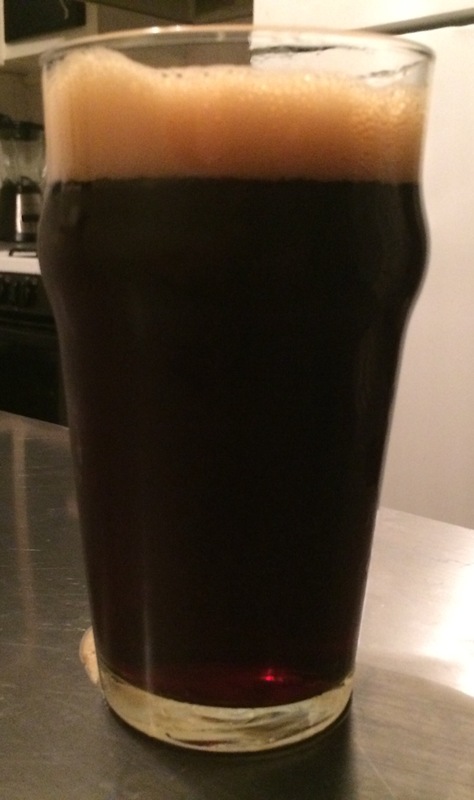 Check out the recipe below for my Gingerbread Beer Recipe. While this is not the only method of making a tincture, it is a great starting point for the newbie willing to experiment. 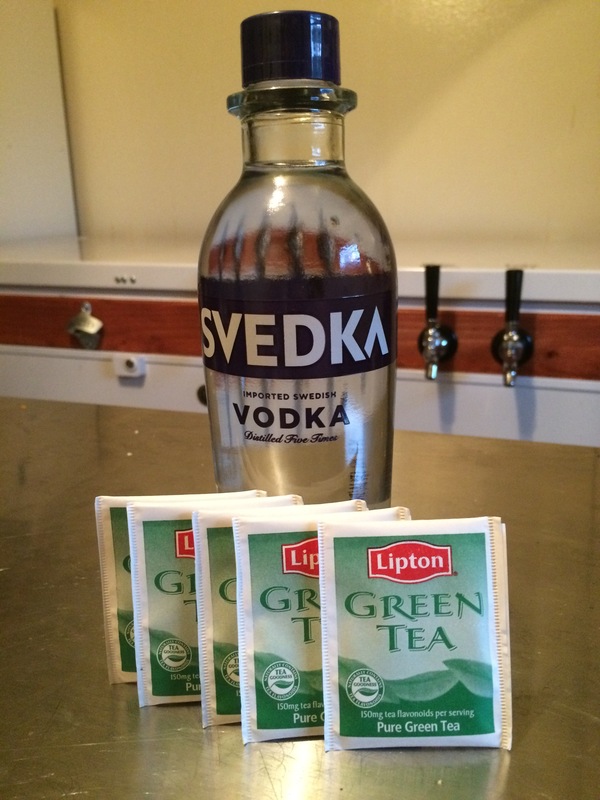 The following pictures are from an experimental green tea tincture I decided to make. 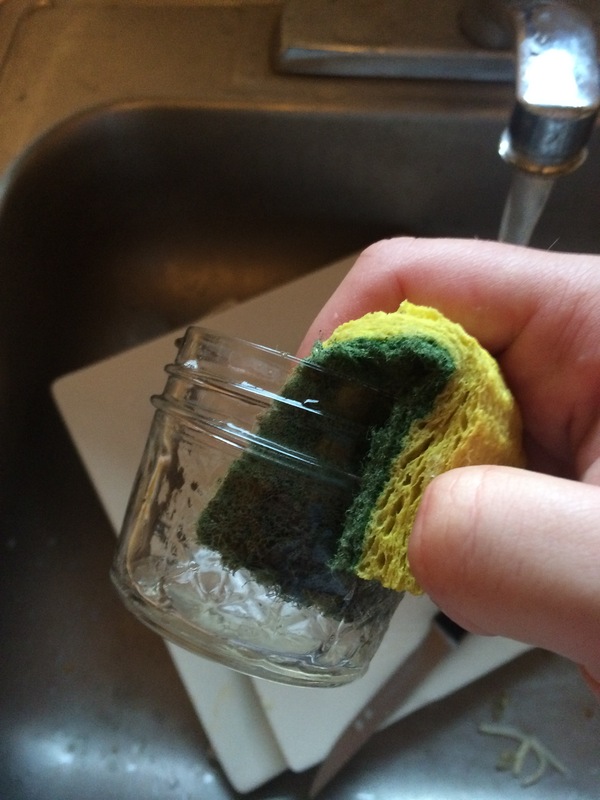 Step 1: Start by thoroughly washing your container. While sanitation is not essential for this process, it is important to make sure there is no dirt which could lead to off flavors in your tincture. 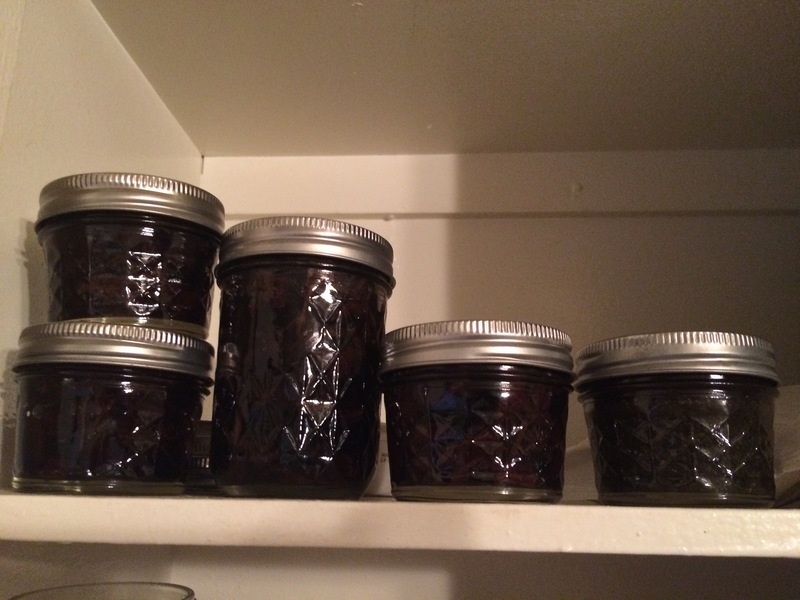 As far as choice of container, I personally like using canning jars. In regard to size, I would recommend either 4 oz or 8 oz jars. They are large enough to provide almost any size tincture, but small enough to easily fit into any space for storage. Step 2: Add your spice or herb to the mason jar. For wet herbs, I would recommend shredding them lightly to increase surface aria and release some of the essential oils. The amount that you use is completely your prerogative and is a matter of personal choice. At this point, it would be hard to go overboard with the amount since you will essentially be diluting this mixture later. Step 3: Add the alcohol to the jar. Make sure that the spirits are completely covering the spice. Step 4: Store the tincture in a dark place. The warmer the location, the faster the extraction will occur. Every few days give the jar a shake to mix the herb/spice and disperse the flavor. After 2 weeks, the tincture will be fully extracted. Longer wait time will only increase the potency. A combination of tasting and trial and error will let you know when its finished extracting. Step 5: Once you have decided that your tincture is finished extracting its time to take the extract off of the herb/spice. There are a number of ways to do this. One is to purchase a fine mesh bag and squeeze until all of the tincture is separated from the left over gloop. 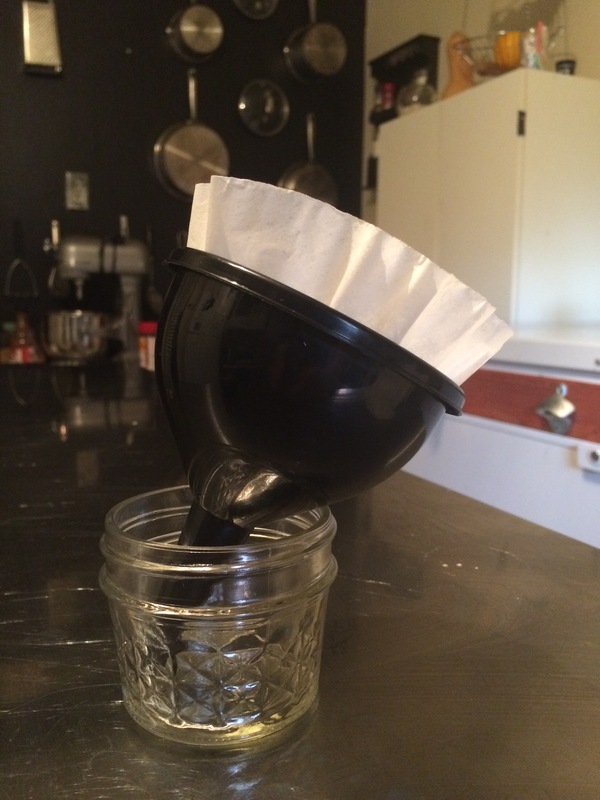 Another way is to use plain old coffee filters. While less efficient than a mesh bag, coffee filter’s convenience and price point makes them a reasonable alternative. Store in a cool dark location. Shelf life should be good for several months before flavors begin to diminish. This beer is the perfect winter brew, combining the rich malt of an English brown ale with the warm spice of gingerbread. This makes an excellent gift to family or friends for the holidays. Although the spice diminishes slightly as the beer ages, the flavor still gives the beer a unique twist. Next time I will consider dialing back on the darker malts in order to balance the profile and make the beer a bit lighter in both body and color. Of pumpkins and parsnips and walnut tree chips“. Americans were desperate for safe sources of hydration, and cider provided an excellent source. The wholesome vision of Johnny Appleseed, planting orchards from his bag of seeds, proves a little more saucy when we think about what those apples were used for. Apples (much like hops) do not grow true from seed. In other words if you plant the seed of a red delicious, you will most certainly not get a red delicious apple in 10 years time. In fact, every one of that apple’s seeds will grow into a completely unique and most likely inedible apple. So… what would be people be doing with these inedible apples? Making Cider of course! Apples come in many different varieties, most of them quite difficult to eat. The main categories of apple are Sweets, Sharps, Bittersweets, and Bittersharps. Each category is defined by the level of of tannin (bitterness) and acidity (sharpness). Sweets: These are your every day edible apples, containing low acidity and low tannin. These varieties make a great snack, but often lend very little to your cider. Varieties include Golden Delicious, Johngold, Macoun, Gala, Fuji, Braeburn, and Honeycrisp. Sharps: These are very interesting apples containing low tannin and high acidity. These are mostly for major consumption but can have some value if you want to add a bit more acidity to your cider. Varieties include Granny Smith, and Rhode Island Greening. Bitter Sweets: Highly inedible yet extraordinarily useful in cider, these apples are high in tannin and low in acidity. These are the darling of the American cider seen, giving the fermenter a sweet base with a substantial amount of tannin for backbone and aging potential. Common Varietals include: Dabinett, Yarlington Mill, Tremlett’s Bitter, and Nehou. Bitter Sharp: These beers are the classic crab apple varietal, they contain high levels of both acidity and tannin. These are pretty much the Cadillac apples of the cider world, often being used as a single varietal cider. They are quite disgusting as a raw apple, but their juice is prized for its ability to be used as a single apple cider, with no need for addition of acid blend or wine tannin. Common varietals include: Kingston Black, Foxwelp, Herefordshire Redstreak, and Porter’s Perfection. Even with the wide variety of apples available, most of us will be fermenting our ciders from pre-blended juice, apple cider concentrate, or locally purchased juice. The juice is often a solid blend of various grapes, making a palatable yet complex unfermented cider. These juice blends often provide a solid base for your cider, but if you need to make some adjustments you can use both wine makers acid blend or wine tannin. Alternatively, you could use oak to add tannin to your cider. 1) Sanitize your Equipment: Follow your basic sanitation procedures. For more information click HERE. 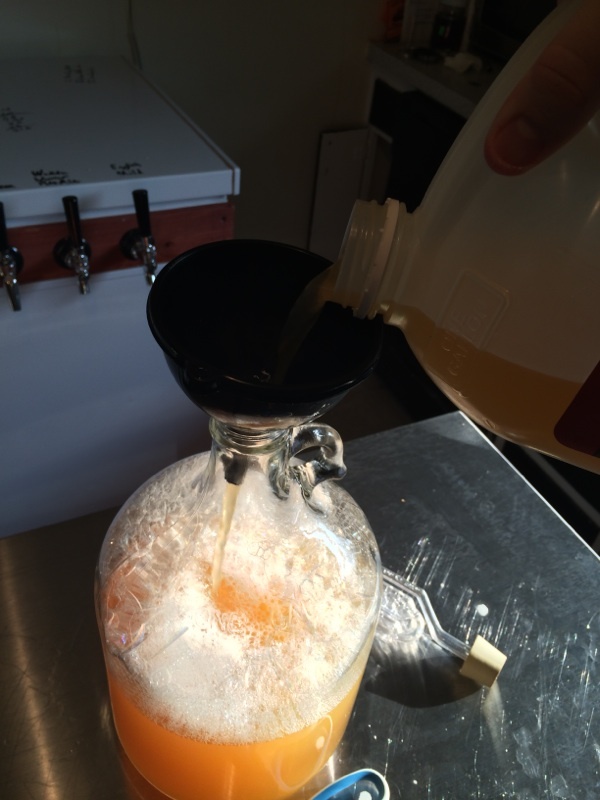 2) Pour your Juice into the Fermenter: Oxygen at this point will only add fermentability to your cider. 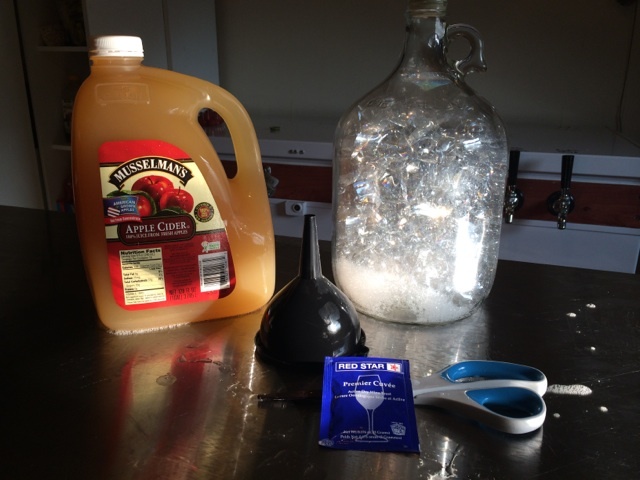 Simply pour your cider through a sanitized funnel into the primary fermenter. 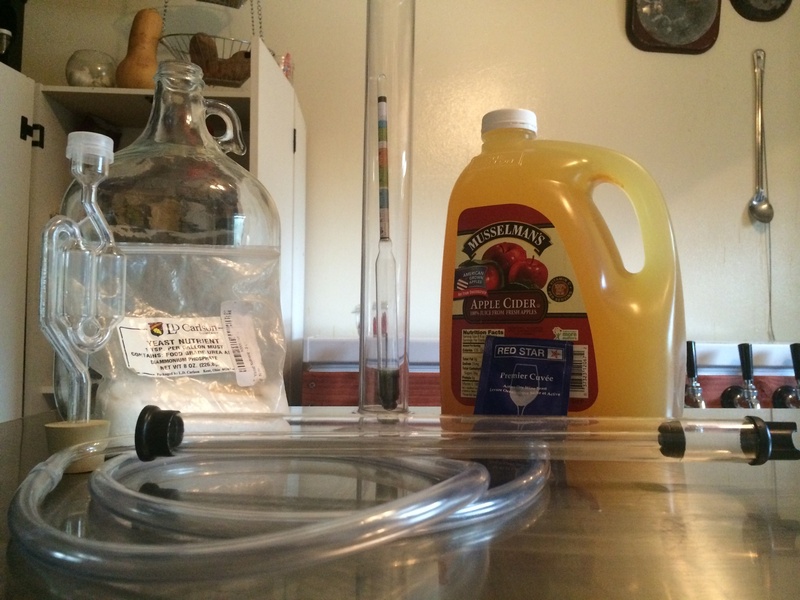 3) Take a Hydrometer Reading: Most cider will come out to about 1.045 original gravity. If you would like to increase your alcohol potential, you can increase your ABV by adding corn sugar (1 lb of corn sugar will increase the alcohol of 1 gallon of cider by 5% or 5 gallons of cider by 1%). 4) Add the Yeast: At this point you have a lot of choice. 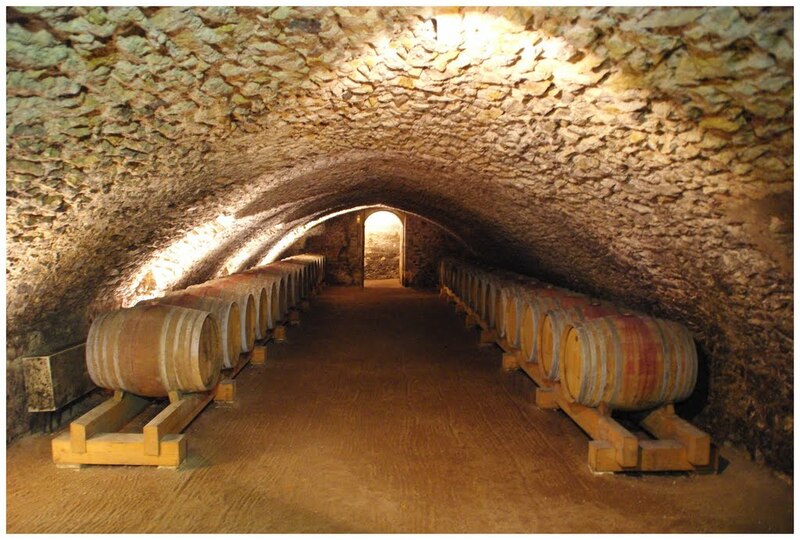 If you are looking for a very clean and very dry fermentation, I would recommend going with Pateur champagne yeast. If you are looking for interesting aromatics, try a Belgian yeast. If you want a classic and clean fermentation, try a yeast that is designed specifically for cider. For my part, I really enjoy a nice dry white wine yeast. 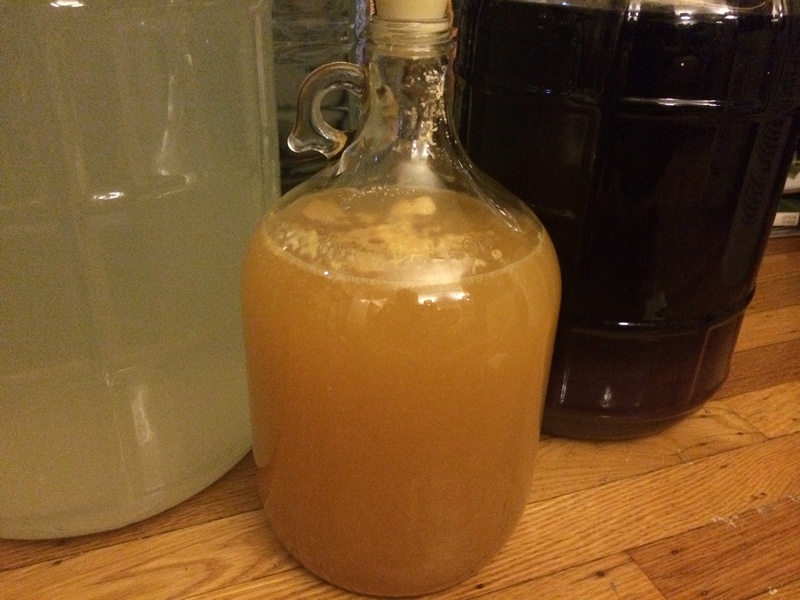 5) Wait and Allow to Ferment: Cider generally takes 1 – 2 weeks to ferment out fully. 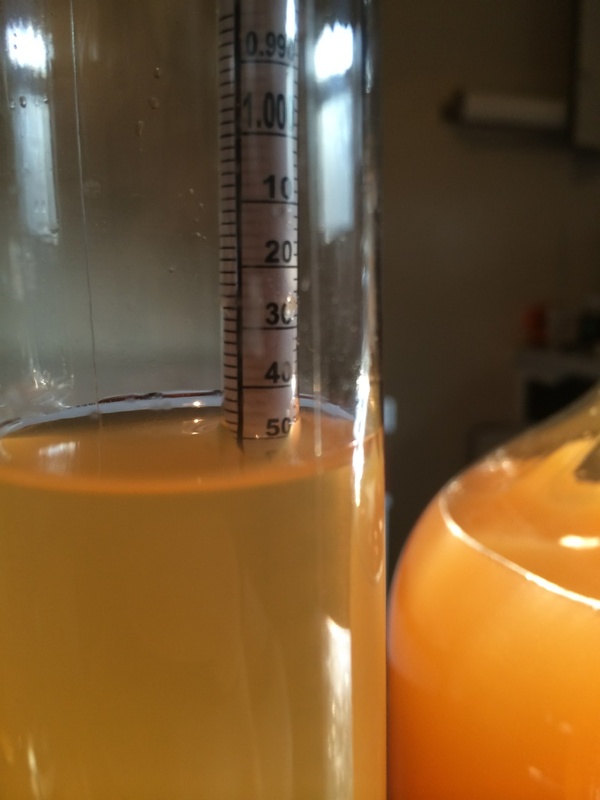 Your goal is to keep the cider at about 70º – 75º F during fermentation. You will most likely notice that there is a great deal of suspended protein and yeast even after fermentation is complete. This is perfectly normal and just requires time to settle out. 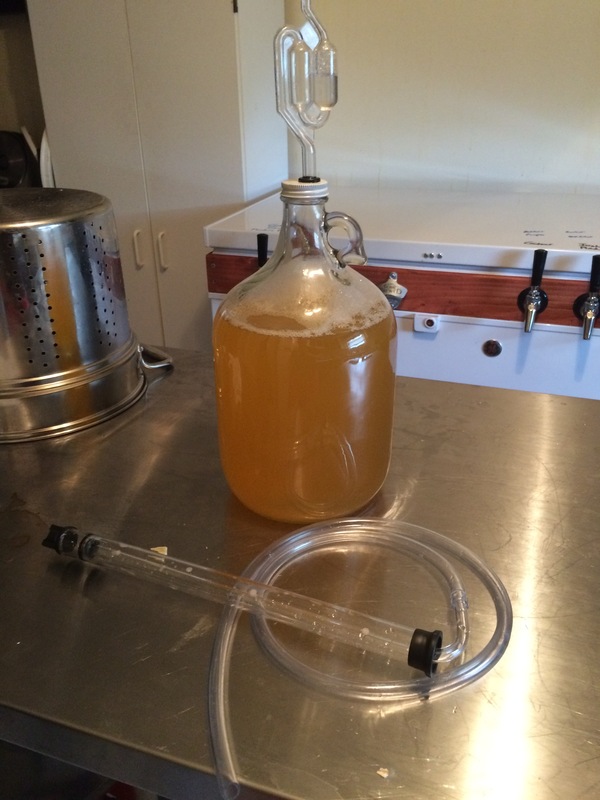 6) Rack to Secondary Fermenter: After your beer is finished fermenting, its time to rack to a secondary container. You simply move your cider from its original fermenting container to the secondary (either a 1 gallon, 3 gallon, or 5 gallon glass carboy). 7) Wait 2-4 weeks: Your goal during this time is to allow the cider to clear, if you find that the cider is taking to long to clear, you can try a clarifying agent such as gelatin, super-kleer, or isinglass. 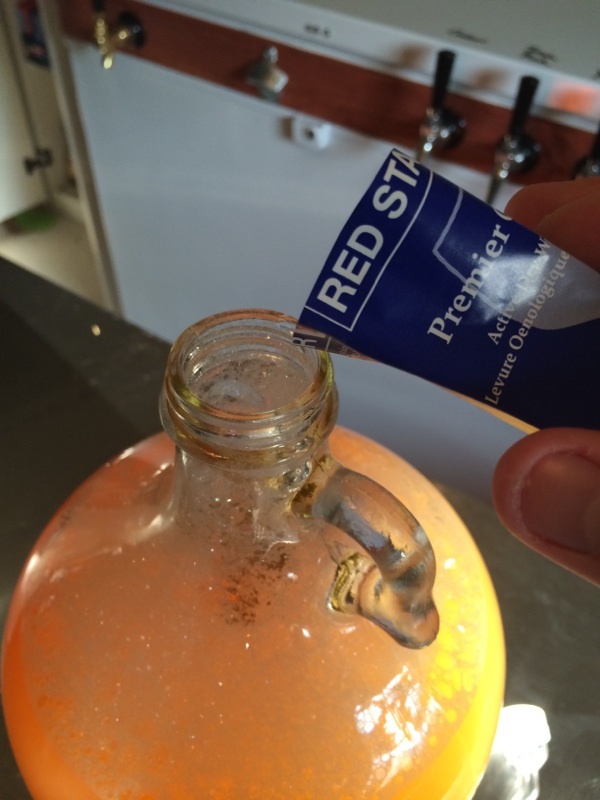 8) Bottle and Prime: One of the down sides to bottling cider is that you can not back sweeten. This creates a very dry cider which is very tasty to some, yet highly undrinkable to others. I have heard of people trying invert (un-fermentable) sugars such as splenda to the cider to allow for some final sweetness in your cider. I can not vouch for that procedure but would be interested to know other people’s results. In general if you want a very carbonated cider (think champagne), go with 1 oz per gallon of priming sugar (corn sugar), if your more interested in a beer type carbonation, try 0.75 oz per gallon. 9) Wait 2 Weeks and Enjoy your Cider: Put your cider in a cool and dark location for 2 weeks, during this time, your cider is going to produce carbon dioxide to carbonate your beverage. After that long and tempting time, chill down to 45 degrees, crack a bottle and enjoy your patriotic beverage. Special thanks to Keg & Barrel Home Brew Supplies for providing the yeast for this project!